When HP shut down webOS device development, they certainly did shut it down. And while they’ve committed to restarting production with the goal of clearing out supplier inventories and satisfying voracious consumer demand for an underpriced tablet, it’s going to be a while before the HP TouchPad makes it into the hands of eager customers. 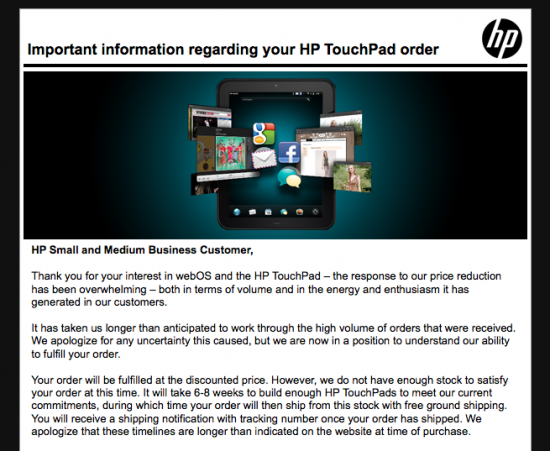 In an email sent out by HP’s Small and Medium Business division to customers that had placed orders for TouchPads before HP realized they were completely out of stock, HP has for the first time acknowledged the time frame we’re looking at before the TouchPad hits shelves: 6-8 weeks, which matches up well with the plans to resume production in October. According to the email, HP intends to fulfill their existing orders “at the discounted price,” which we’re anticipating being the case with the rest of the existing orders and the sure-to-sell-out-quickly general sales availability. The full email is after the break, if you’re wanting to read the whole thing. Thank you for your interest in webOS and the HP TouchPad – the response to our price reduction has been overwhelming – both in terms of volume and in the energy and enthusiasm it has generated in our customers. It has taken us longer than anticipated to work through the high volume of orders that were received. We apologize for any uncertainty this caused, but we are now in a position to understand our ability to fulfill your order. Your order will be fulfilled at the discounted price. However, we do not have enough stock to satisfy your order at this time. It will take 6-8 weeks to build enough HP TouchPads to meet our current commitments, during which time your order will then ship from this stock with free ground shipping. You will receive a shipping notification with tracking number once your order has shipped. We apologize that these timelines are longer than indicated on the website at time of purchase. At the significantly reduced price, the HP TouchPad does not qualify for our standard 30 day return policy and is not returnable. If this delay is not acceptable, please send an email to TouchPadCancel@hp.com with your instructions for cancellation within a week. Be sure to include your HP order number and the name and ship-to address on the order. Also please indicate clearly if this is the only order requiring cancellation or if you wish all orders in your name to be canceled. You will receive an automated cancel notification when your order cancellation request has been processed. Please be aware, however, that cancellations cannot be reversed, and our US SMB store has sold out of HP TouchPad and will not make any further available for sale. We are pleased that we will be able to fulfill your order and look forward to you joining the exciting community of webOS! Source: HP; Thanks to Chris and Drew for the tips!